When it feels like 100 degrees outside, what's a princess to do??? Why take a nap in the A/C with my favorite blankie and stuffed animals. ***Updated spice drawer since post at Honey We're Home. Linking up to Courtney's today for some organizational inspiration! However, my husband and I have accumulated several more spices as we have started experimenting with different types of dishes (we both love to cook and try new recipes). So, the smaller drawer just wasn't working anymore. We also recently purchased a new holder for our kitchen knives (post to come) so that we could keep them on the counter where they would be easily accessible to us while prepping our food. That freed up a larger drawer right near where we prep our dishes...PERFECT as this is where we would most likely be seasoning our food as well. We purchased an expandable in-drawer tray from the Container Store. At first we stored the spices in their original bottles, but since they weren't all the same size and shape I felt like we were wasting some space. I went back to the Container Store after seeing a post my dear blogging friend Ashli of Mini Manor posted about kitchen organization. You can read Ashli's post here. Also, if you have never checked out Ashli's blog...it is a must! She is a genius at simple, green, practical home decor and organization! Ashli used clear containers, all the same size, and labeled them using labels by Avery from the new Martha Stewart line available at Staples. If you haven't checked out Martha's new line of office products, do!! The end result was a very organized, functional spice drawer. Another thing I purchased was this fantastic spice funnel. The perfect size for transferring spices from a larger container to the smaller jars. Have you organized anything new lately? Hi everyone! I am super excited to be here at Honey We're Home. I adore Megan and her blog, so naturally I said yes when asked to guest post for her Organization Series. I'll also let you in on a little secret...I am super obsessed with being organized, to a fault, really!!! I grew up with a Mother and Grandmother who adhered strictly to the "A Place for Everything and Everything in Its Place." It rubbed off! My mom did her best with a household of four children (3 boys, 1 girl) and working fulltime as a registered nurse to keep things organized and running smoothly. My Granny and Pop watched over us while she was working, so needless to say she too wanted things to run smoothly. Now, that is not to say that on the rare occassion a guest would to surprise my mom with a visit, that she wouldn't frantically run from room to room throwing things in the bathtub and closing the shower curtain!! Just keeping it real. I thought long and hard about what part of Organization I wanted to share with each of you, and finally settled on the Kitchen-the hub of our home. We have two beautiful daughters who have ALWAYS been on the go with sports/activities, so keeping our kitchen organized was essential to things running smoothly. Lunches were easy to pack, meals easily prepared, and any necessary paperwork/information was always within reach. So, with that said...I'll walk you around a few places of importance in our kitchen. Next up, our Baking Pantry. This is where I store all things necessary for baking-flour, sugars, oils, vinegars, syrups, cookie cutters, cupcake liners, etc. I use a metal tray to keep all the oils, vinegars and syrups in. If something drips or spills, it is so much easier to clean up. The last pantry is what I call our Snack Pantry. 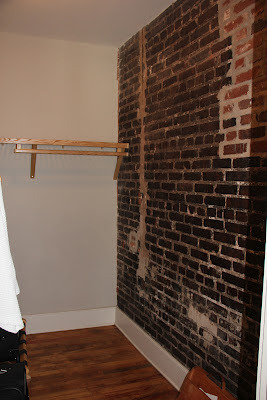 This is where we store crackers, cookies, chips, popcorn, granola/protein bars, fruit snacks, cereal, oatmeal/grits, etc. I am a huge fan of OXO Clear Good Grips Pop Containers. They are a bit pricey, but sooo worth it. I can always see what we have, or if we are running low. The other thing I believe is essential to a well organized kitchen is well thought out placement of items you use everyday, such as your dinnerware, glasses, utensils, cooking utensils, baking pans, etc. For instance, I store our spices in one drawer in my island next to my cooktop and the drawer opposite contains all my cooking utensils, and the cabinets underneath contain all my pots and pans. This puts everything necessary for preparing a meal right a my fingertips. I am all about Zones in a kitchen. I believe everything should be placed where it is easily accessible and easy to put away. That is why the cabinets around our sink and dishwasher contain our dinnerware, drinking glasses, utensils, extra cooking utensils, tupperware containers, etc. This makes setting the table a breeze since it is just a step away. And, unloading the dishwasher takes no time at all. I also keep our baking sheets, pans, heavy duty tin foil, and cutting boards next to our oven/microwave. This makes preparing something to bake a snap. I could go on and on, but I think you all get the picture. I will leave you with two final things I couldn't live without-an organized Junk drawer (yes, it can be done) and an Important Numbers Binder. This binder contains all important phone numbers (emergency, family, doctors, neighbors, schools, vet), neighborhood and club directories, phone manuals, a first aid manual, and the girls' school calendars. It is housed in the top drawer of my desk and within reach when on the phone. 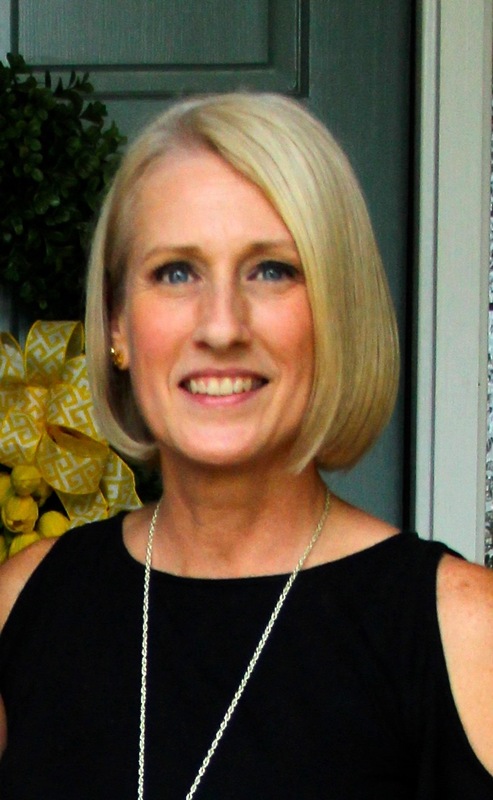 Thanks Megan for inviting me to share something I am passionate about with your readers! Wow, is it Wednesday already? This week is just flying by. Yesterday, a dear friend of mine treated me to a belated birthday lunch. We ate at a local bistro called TEN, owned and operated by one of our neighbor's brothers. They serve wonderful all natural, organic dishes. The name TEN came about after they decided to incorporate ten recipes from locals into their menu. If you are in the Atlanta area, please stop in and see them (oh, and the most fabulous shopping area is just up the street). My girlfriend also presented me with a wonderful cookbook featuring Savannah dishes. She knew Mark and I had visited last spring and loved the food we had while there. She thought we would be able to replicate some of them using this book. The name of the book is The Savannah Cookbook by Damon Lee Fowler. It was actually a funny moment because we had just been discussing how much we (well more Mark) have enjoyed looking through cookbooks and trying new recipes throughout the week. Our youngest daughter is a great guinea pig, she will try most things at least once. Well, after she presented me with my present, and I opened it to find the cookbook inside...I laughed, and told my girlfriend, "Mark is going to come home from work, ask how lunch was, see the cookbook gifted to me, and ask what's for dinner." Fast forward to late afternoon, Mark comes home asks, "how was lunch (eyeing the cookbook I had left on the counter) and asks, what's for dinner." I replied, "maybe we you should try something out of the new cookbook." We He prepared Sherried Shrimp. It was super simple, yet quite delicious. We served it over jasmine rice (I love Trader Joes frozen package rice...just pop the bag in the microwave and perfect rice in under 5 minutes). 1 large clove garlic, lightly crushed and peeled but left whole (the directions state to use 2 if your shrimp are not fresh-meaning you don't live in Savannah or on the water where they are caught and you eat them the same day). 1. Heat the garlic and butter in a large sauté pan over medium heat. Cook until the garlic is golden, about 2 minutes, and then remove and discard the garlic. Add the shrimp and sauté, tossing frequently, until they are curled and pink, about 3 minutes. Season well with salt and cayenne, both to taste, and remove them with a slotted spoon to a warm platter. 2. Add the sherry and bring it to a boil, stirring and scraping the pan, and let it boil half a minute. Stir in the parsley and pour it over the shrimp. Serve at once, over rice or with plenty of crusty bread to sop up the sauce. As many of you know, I am the proud mom to two beautiful girls. 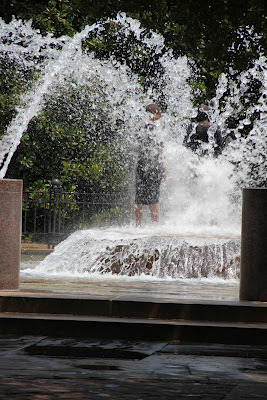 Well, my oldest has now joined us in blog land after many months of stalking following my favorite blogs and friends. Please be sure to click over and say hello to Elie! And yes, mom is SUPER jealous...she designed all of her graphics herself!! This past weekend I sat down to create a new wine cork trivet. We had one already, but it was starting to show it's age, and wear and tear of everyday use. I started by purchasing Wine Enthusiast's 16" bulletin board kit. I love this size for two reasons...1) it fits perfectly next to our cooktop on our island, and 2) it is the perfect size to set hot dishes and pans coming straight out of the oven on. When the weather is not 100+ outside, we use it just about everyday to set hot dishes on. However, these days we are cooking on the grill...I am not heating up the oven in this heat! You will need to collect your corks prior to starting the project. Having a good variety makes it easier to create unique patterns and I like finding a few that are a bit different. Then all you need is either a glue gun, wood glue and or good craft clue. I like to use Alene's Quick Grab Craft Glue. It works really well. It gives you time to adjust the corks if needed, but when dry hold the corks securely in place. We have found that the easiest pattern is two and two, two horizontal followed by two vertical. I have also found using two of the same "brand" make the fit better. I save the random, fun ones for the single finishing row. disclaimer: we may or may not have consumed the wine in order to collect this many corks! As I mentioned in my post yesterday, my hubby was cooking a rotisserie chicken on our new grill. Today, I thought I'd share the recipe and some pictures with you. This is the second time we have made this recipe and it was delicious once again. The chicken turns out super moist. In a large, deep, non-reactive bowl combine the following: oil, lemon juice, orange juice, vinegar, piri-piri- sauce, paprika, cumin and 1/2 tsp each salt and pepper. Stir in parsley, ginger, thyme, and garlic. Spoon out and reserve 1/4 C of marinade for basting later. Place chicken in the bowl and turn to coat evenly-okay...here is where we simplified things...place the chicken in either a brining bag or very large ziploc...pour marinade over, seal and place in a large bowl just in case of leaks and refrigerate at least 2 hours or up to 12 (we marinate ours overnight). You may want to turn it occasionally. Prepare a charcoal or gas grill for rotisserie (if you do not have a rotisserie you can grill indirectly on medium high heat or roast in the oven). Charcoal: if using wood chips, sprinkle about one third of them on the coals. Secure the chicken onto the spit. Or place chicken breast side up on the rack over the drip pan. Cover the grill and cook the chicken, basting occasionally with the reserved marinade, until the juices run clear when the thigh joint is pierced with a knife tip, about 1 1/2 hours. Add more coals as needed, and the remaining wood chips, in 2 batches. To test for doneness, insert an instant-read thermometer into the thickest part of the thigh away from the bone; it should register 170* F (77*C). The temperature will rise another 5-10* F (3-6*C) while the chicken is resting. Transfer the chicken to a cutting board and let rest for 10 minutes before carving. ****note, this recipe can be found in the Williams-Sonoma Essentials of Grilling Cookbook. Hubby covers the wings with a bit of foil to keep them from burning. 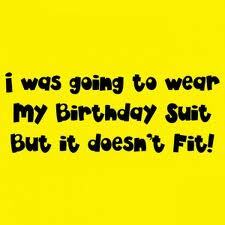 I love it when I get to celebrate my birthday beyond the "actual" date. The cool thing is that the necklace and earrings "flip", pearls on one side, crystals on the other, and the bracelet goes perfectly with either! They did good don't ya think? Told you they were gorgeous! The most beautiful pinks!! And, tonight hubby is cooking a fabulous rotisserie chicken on our new bbq grill! Will share pics soon, along with another fabulous chicken recipe. I mentioned in my post yesterday, that while we were in Charleston we ate at the Charleston Grill. There was an item on the menu that caught our attention, but the portion size kept either of us from ordering. While we both love a good steak, a 22oz ribeye was a bit much! However, the young man sitting at a table across from us had no problem eating the entire thing. He was in is 20s, a growing "boy", who could blame him!! As I mentioned, we both love a good steak. I love mushrooms, hubby does not (he calls them fungus and doesn't understand why anyone would eat them). It was the salsa verde that got our attention. We would have never thought of pairing it with a good steak. A good Mexican dish-yes, a 22oz steak-no. We decided to create our own version after we came home. Yes, we omitted the mushrooms. Hubby seasoned the steaks with salt and pepper, and placed them on the grill. Before removing them from the grill he topped them with a bit of the salsa verde. We added a bit more once plated. We opted for some fresh yellow squash, seasoned with Trader Joes 21 Seasoning Salute (awesome on veggies) as a side. The two went perfectly together. The verdict...Salsa Verde paired with a nice juicy ribeye was delicious! Is it just me, or is this summer just flying by? Seems like just yesterday we were attending our youngest's high school graduation. Now we are four weeks away from college move-in day!! For Mother's Day, I received a trip to Charleston over the 4th of July week from my hubby and sweet girls. So today, I thought I'd share a few pictures from the trip. Mainly those of the incredible loft we stayed in. 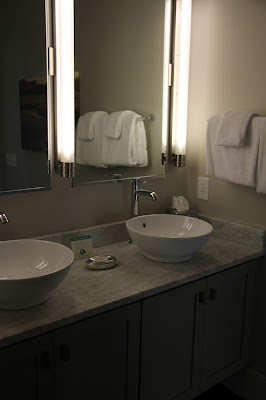 We stayed at the Restoration Inn on King Street. Originally the hotel was meant to be condos, but when the economy hit the tank and they weren't selling, they decided to turn it into a hotel with time share options. There are plans in the works to add on in the near future, but right now there are just 15 rooms. I cannot say enough about the staff...so pleasant and helpful. Wine and cheese was served each evening in the lobby, and milk and cookies later at night. It was a great way to meet and mingle with the other guests staying there. And, for the 4th they had a rooftop celebration complete with wine, cheese, and champagne. We could view the fireworks without fighting the crowds. It was a lot of fun. 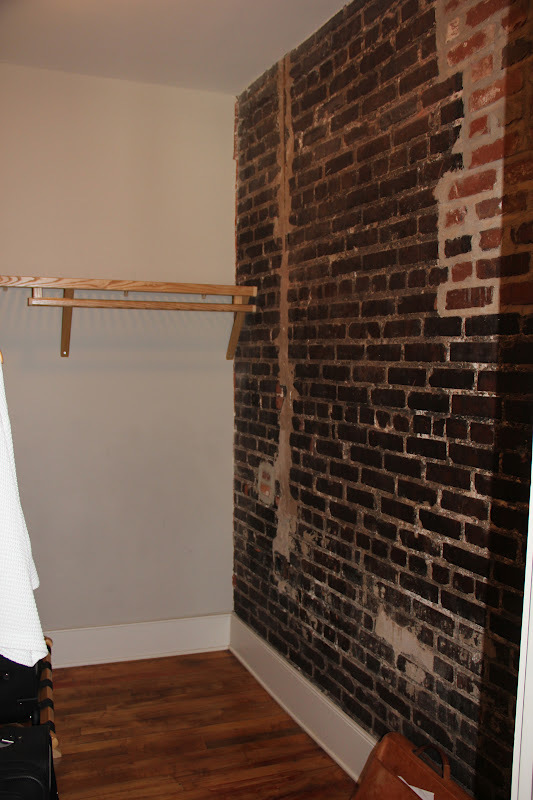 The closet...I just love the exposed brick walls throughout the loft! Sink area in main bath. Open concept living area and kitchen. 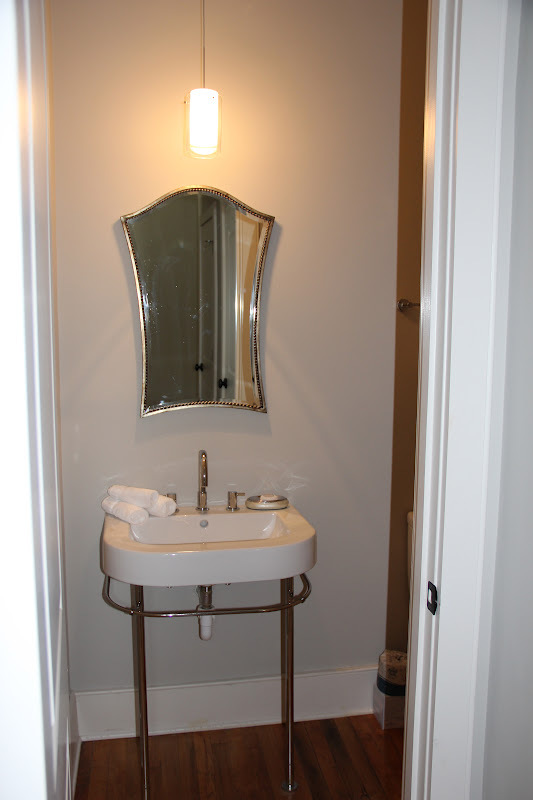 Loved this 2nd guest bath. So simple. Another view of the living dining area. Notice the mirror in the background? Love! Loved the dark wood cabinets with the stainless steel appliances. The old wood floors. Oh how I wanted to take these home. Distressed and sooo smooth under your feet. This is how breakfast arrived each morning from a local bakery. Close up of the mirror. This little guy kept trying to get my attention in the park. One of the few cool shady spots to rest. The popular attraction for all the kiddos visiting the city! The old Kress building was across the street from our porch outside our room. Each night we received chocolate covered almonds on our pillows, yum! The rooftop was the perfect spot to view the fireworks. 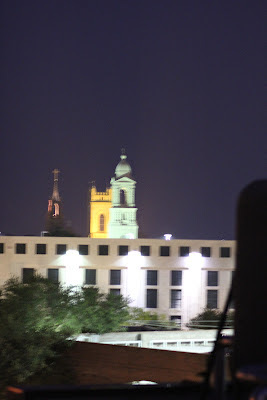 You could see 7 or 8 church steeples from the roof as well. 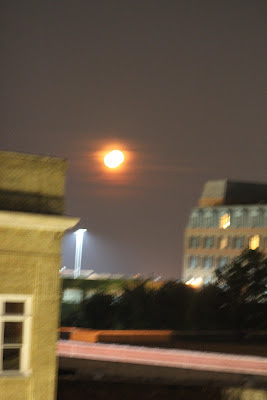 The moon that night was the most vivid orange. Despite the heat, we had a wonderful time. We ate at the Charleston Grill our last night in town. The food was amazing. We did not get to eat at the famous Husk restaurant...it was booked solid for a month! Thanks to the award from Bon Appetite!! Maybe next time. My posts will most likely be hit and miss over the course of the next few weeks as we get baby girl ready for college. I am looking forward to blogging more once she is all settled.